← It’s another TRUE day! Well, I guess old sayings become old sayings for a reason. 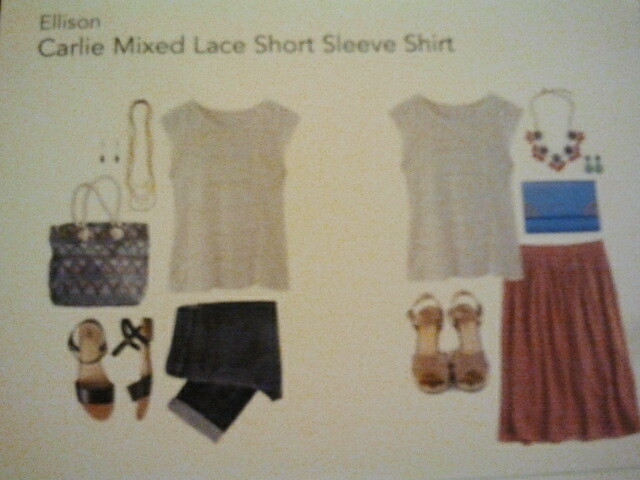 Trying StitchFix for a third time was definitely the charm! Admittedly, when I read the descriptions of what I was getting, I was a little underwhelmed by the list. 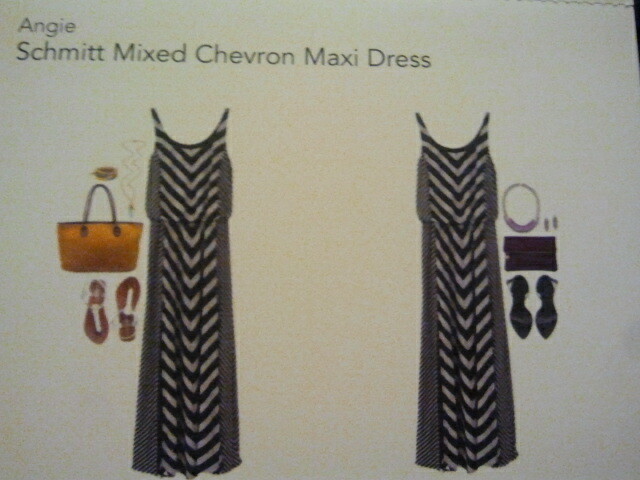 Of those five items, only two seemed like maybes – The Maxi Dress (Although…$78 for a cotton dress? Ouch!) 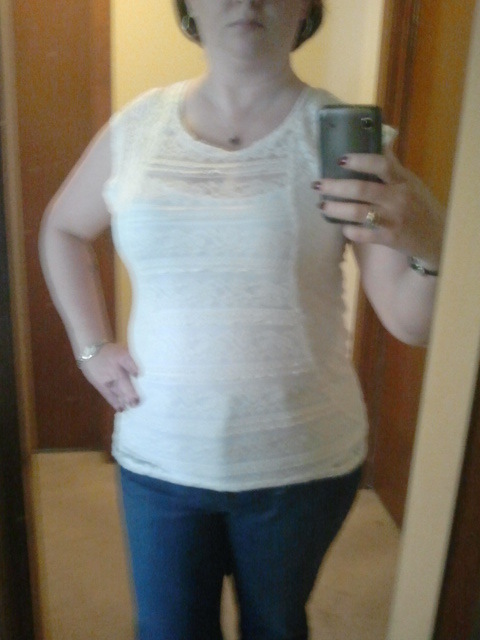 and the lace shirt. But, like a good girl, I tried them all on – well, except the bag. 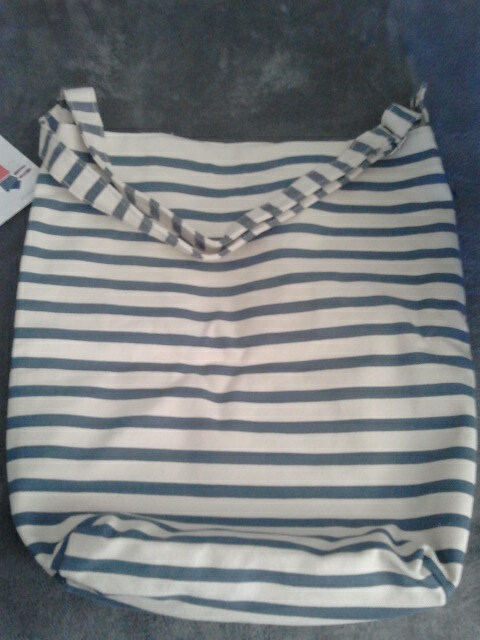 It’s a bag after all! A little background: I had updated my profile, including a little (snarky?) 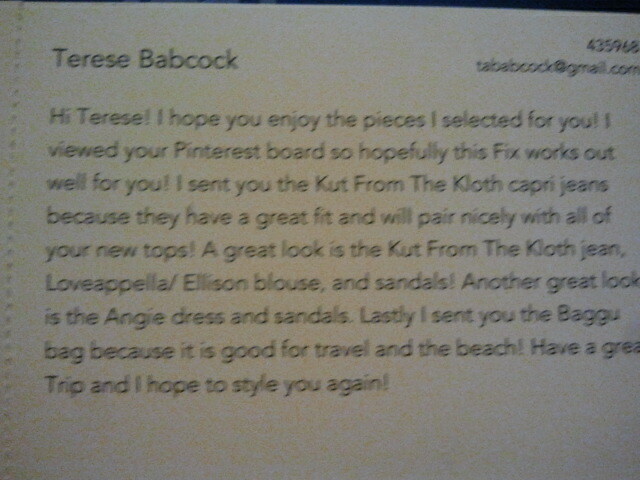 message about actually looking at my Pinterest board and reading my profile. I had also specifically requested items that would work for a my upcoming trip to Costa Rica. Since I can purchase a beach bag much cheaper elsewhere and I won’t worry if it gets damaged or lost on the trip, I didn’t think this was worth the $40. So, this bag went in the return bag. This was one of the maybes. From the picture, I really liked the general shape of the dress and the patterns. When I pulled it out, I liked that there was not only one thigh-high slit in the dress, there were two – one on either side of the large stripe panel on the front. 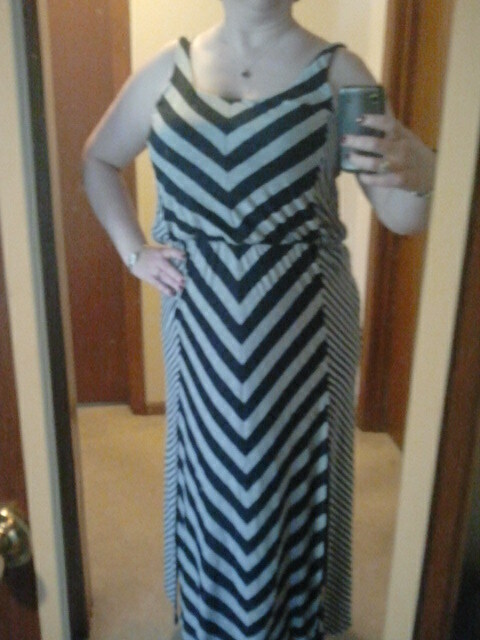 I’m always looking for a maxi with a slit, so this raised its value in my eyes. The top was a bit unflattering, in that the waist didn’t fit where a waist should be nor did it get pulled up to make it a “high-waisted” fit. The sewn-in waist hit right at my ribcage, which was awkward and a bit uncomfortable. 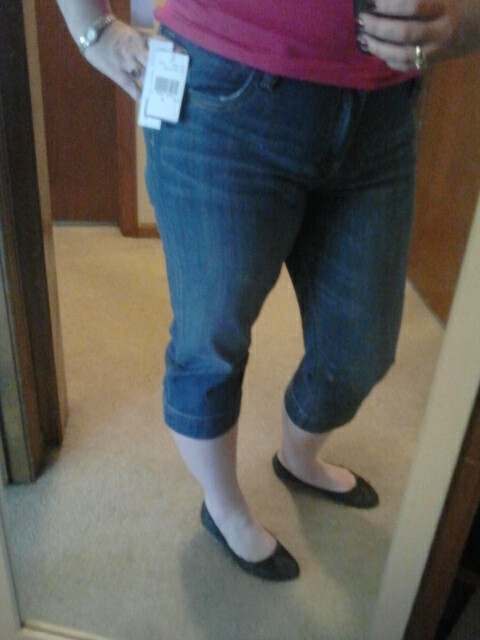 If it had been half the cost I might have considered it, but at $78 I want a perfect fit. Bummed but it had to go in the return bag. I thought I had checked the “no bottoms” option, but I guess I didn’t. Capri as a concept would fit well for the trip, but denim is heavy and hot for CR. I went ahead and tried them on, just to see the fit. Definitely a good fit from the hips down. Really good fit, actually. But they’re low-waisted and this mommy-of-twins definitely needs pants that are at-the-waist. 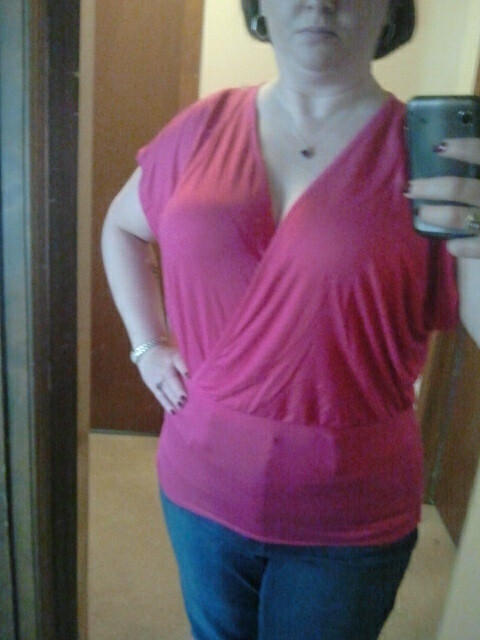 The enviable muffin top was hidden by the shirt I tried on with them and I refuse to show you the reality. Trust me – not pretty. Back in the bag they went. This had potential when I saw the card and when I saw it in person. There was a nice tank top included to wear underneath and the overall look was “okay”. Not great, but nice. The sleeves were a bit awkward – I think it would be better as sleeveless or with regular sleeves but these not-quite-cap sleeves were weird to me. There were little cut-outs on the back as well (I accidentally tried to use one as a sleeve – there’s your laugh for the day…) but overall the effect was just…meh. Back in the bag it went as well. Just as I was losing hope, I got to the 5th item. 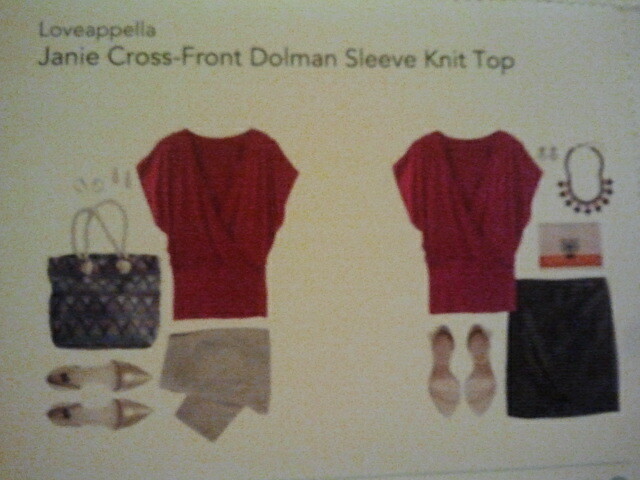 I’d already written this off in my head since it’s a dolman sleeve. My first box had a green dolman sleeve top in it and I had written somewhat unfavorably about the lack of form and attractiveness of the style and I thought they’d ignored that (again). 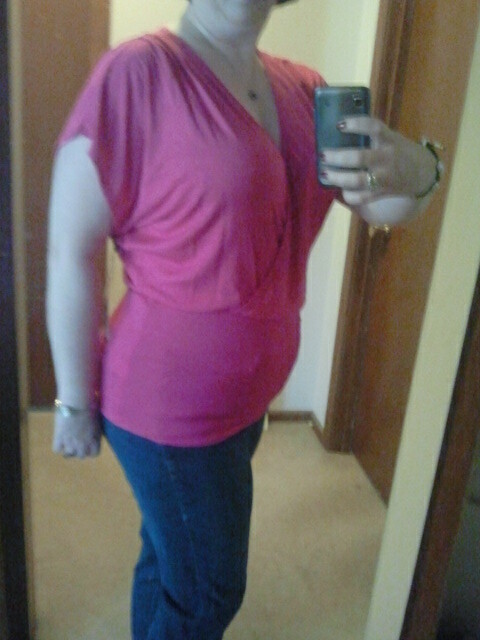 But, this has a fitted waist and the cross-front was rather flattering for my shape. And of course – HOT PINK! Very wonderful! Love love love love love! So, I kept it. Duh! I even stuffed it into my suitcase as I was running out the door for the airport because I wanted to have it for my girlfriend lunch on Sunday. What’s even better about it is that I can dress it up or wear it with jeans. Seriously – I love it. Since I’d already paid the $20 stylist fee that would be deducted from the cost or be lost to me, I justified the purchase by saying it would only be $34 (more). Finally, with the “third times a charm” cliche in place, I finally have a KEEPER!! I’m still not 100% sold on this service for bigger women, but I’m now more of a fence-sitter than a “hell no”. And I’m willing to try at least once more. I’ve asked in several places for this third stylist again; unfortunately her (his?) name wasn’t on the card, so I can’t ask by name. But, since I’ve been glowing (more or less) in this review, I hope they listen. I think the right stylist makes a HUGE difference in what makes it into your box. And, from other blogs I’ve read, I definitely think if you’re a smaller size (4-1o) you’re going to have better luck with this service simply because they have a wider range of options to send you. You might have to try a few times to get them to understand your true size if you’re bigger (12-14 and/or top-heavy). And regardless of your size, if you’re pretty particular on your style or not much for a lot of experimentation, it make take a few tries for them to nail down your style correctly. But, for $20, I say try it out and see what you get! 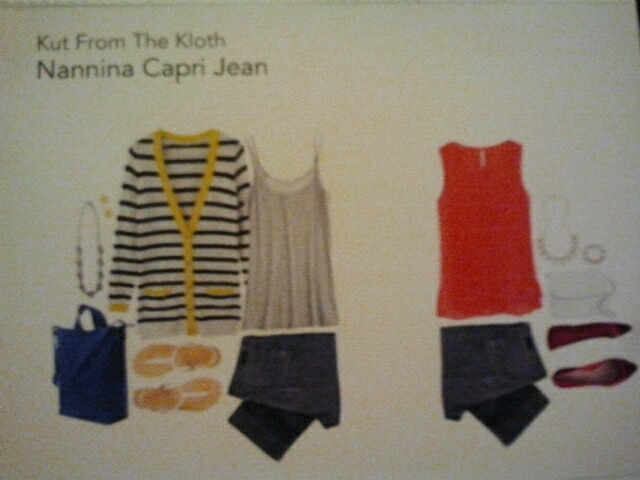 Posted on April 14, 2014, in Reviews and tagged beautiful, Chevron Maxi Dress, Dolman Sleeve, happiness, Kloth Nannina Capri Jean, Kut from the Kloth Nannina Capri Jean, Maxi Dress, Melanie Canvas Duck Bag, shopping, StitchFix, subscription boxes. Bookmark the permalink. 2 Comments. 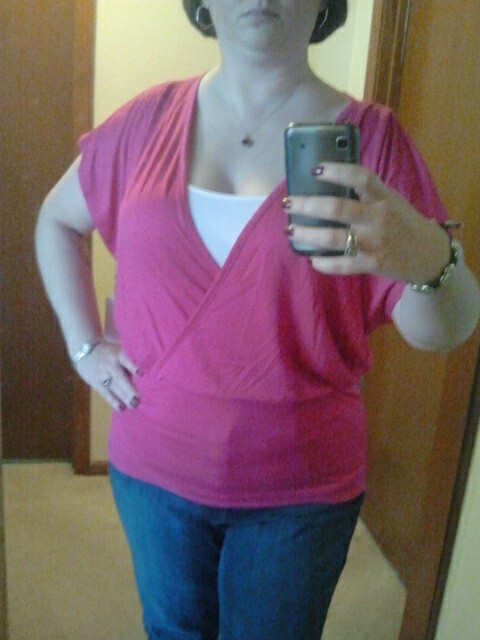 As an attendee of the girlfriend lunch, I thought you looked fabulous in the pink knit top! Thank you! I wore it again today (washed last night, of course) and I think the guys in choir liked it too. 😀 Definitely my new favorite / go-to shirt for comfort and cuteness!